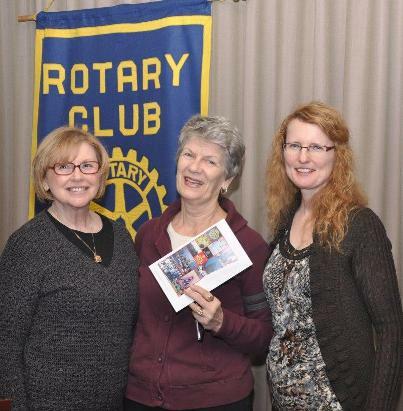 Margaret Jean, Irene Good and Beverly at the Ladner Rotary Luncheon. Recently, I was asked to give a talk to the Ladner Rotary Club on Asperger’s. The date they had in mind was only four days away. Probably their scheduled speaker bailed, but I’m just happy to have a chance to increase awareness. It’s all good, right? Four days? I could do this. I phoned my daughter, Bev right away. “A room full of business people?” Bev asked. “Great. We’ll talk about Asperger’s in the workplace.” See why I called her? Bev always knows what to do. “Okay, I’ll talk about the origins of Asperger’s just to be sure they know what it is, and you do the workplace part,” I said. She agreed. Here’s a bit of my part of the speech. Thanks for inviting us to speak today. Free lunch is always good. But imagine if someone, say a co-worker, asks a person to lunch, and right away that person becomes anxious? Clearly apprehensive. Wouldn’t that be amazing? But for some people with Asperger’s, it wouldn’t be unusual. So what is Asperger’s, anyway? And why is it called that? Asperger’s came to be known as such this way: In 1944, in Austria, a paediatrician detected some odd behaviour in four of his young patients. They did not socialize well with the other children. Their non-verbal communication skills were virtually non-existent. When they talked? Their language was stilted or formal. And they seemed to each have a favorite topic which was of intense interest to them, and therefore dominant in their conversations. And finally, they seemed to have little or no empathy with the other children. These findings were published, but only in Germany. The doctor’s name was Dr. Hans Asperger. It wasn’t until 1981 when a British physician and psychiatrist, a Dr. Lorna Wing, published several case studies of her own, that Asperger’s was introduced to the world. Dr. Wing’s case studies exhibited similar symptoms as the children the Austrian doctor had observed, and she referred to them as having “Asperger’s Syndrome”. Her studies were widely read and published, and her 1996 study is considered by some to be the definitive work on Asperger’s. In 1992 the World Health Organization added Asperger’s to its list of diseases and disorders. In 1994, The American Psychiatric Association added it to their manual of Mental Disorders. But today, researchers such as Simon Baron-Cohen of Cambridge University and Dr. Jim Tanaka of UVic emphasize that Asperger’s is not so much a disorder, disability or disease; It is more a difference in how the brain processes information. Stay tuned next week for Bev’s part of the talk!